You’ll love this worry-free and DELICIOUS edible cookie dough made with toasted flour and no eggs! Easy to make and store for an indulgent anytime treat! 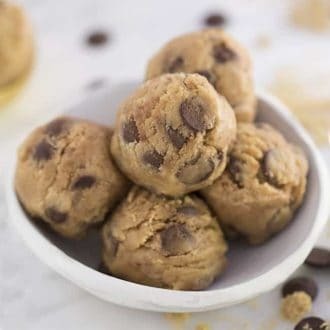 Big notes of vanilla, brown sugar and chocolate take this cookie dough recipe over the top for some serious indulgence. If you love chocolate chip cookies then this recipe is a must make! It comes together in less than 5 minutes in one bowl and keeps in the fridge or freezer to satisfy those late night cravings in an instant! Is it safe to eat edible cookie dough? 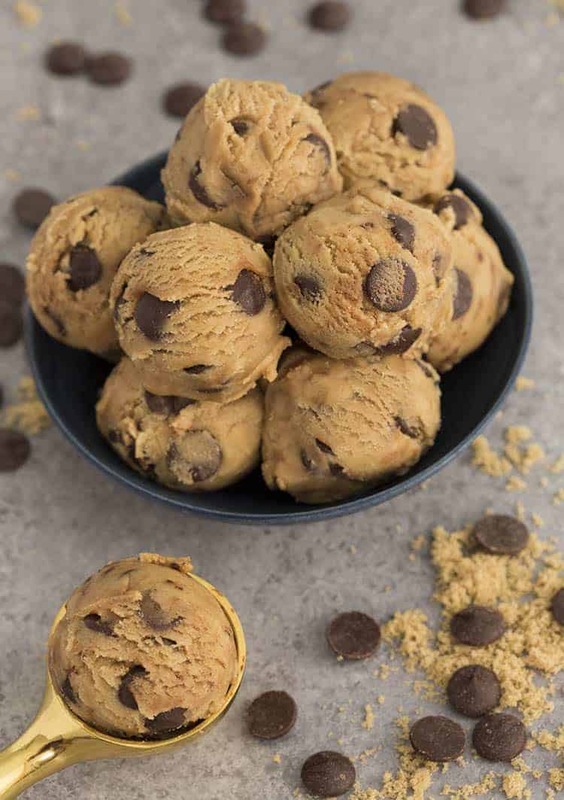 Edible cookie dough does not contain eggs and the flour has been baked so potential exposure to bacteria and other pathogens has been minimized. While most people know that eating raw eggs carries the risk of salmonella many don’t know raw flour can have bacteria like E. Coli. and parasites so it’s important to bake it and kill any unwanted baddies. Can you eat raw cookie dough with eggs? You can use the eggs to make raw cookie dough now! Spread flour onto a baking sheet and bake at 350F for about 12 minutes. Add partially melted butter and sugar into a stand mixer. Add milk, vanilla, and salt. Drop in the chocolate chips, toasted nuts, sprinkles or whatever else you like and mix for a few seconds on low to stir in. Because they don’t bake you actually have a lot of latitude to play with the recipe! Reduce the sugar, add more milk, try subbing some of the chocolate chips for toasted walnuts. Everything works because you don’t have to worry about the bake! Cookie dough will keep in an airtight container refrigerated for up to five days or in the freezer for two months. Sub half the flour for toasted almond meal for a delicious boost of protein! 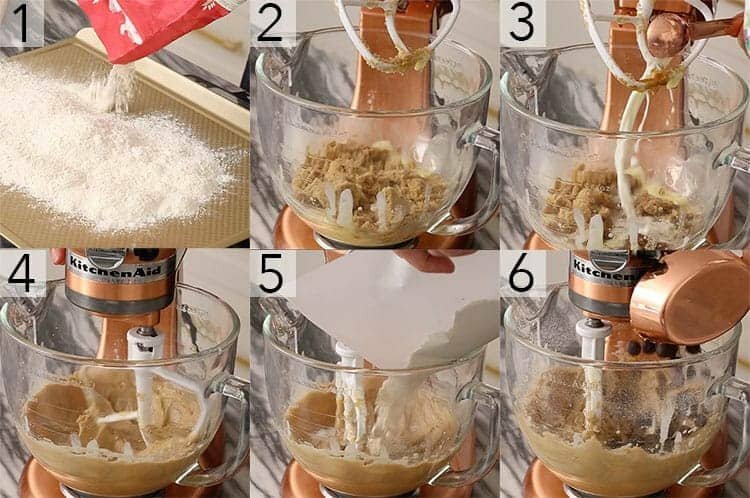 Make this into edible sugar cookie dough by using 1 cup of white sugar instead of the brown and skipping the chocolate chips. What happens if you bake edible cookie dough? I couldn’t resist seeing what would happen so I baked a cookie with my edible dough! The result was FINE. Not the best but definitely edible. An edible cookie dough recipe doesn’t have leavening agents so the baked cookie ends up being dense and spreading out more. 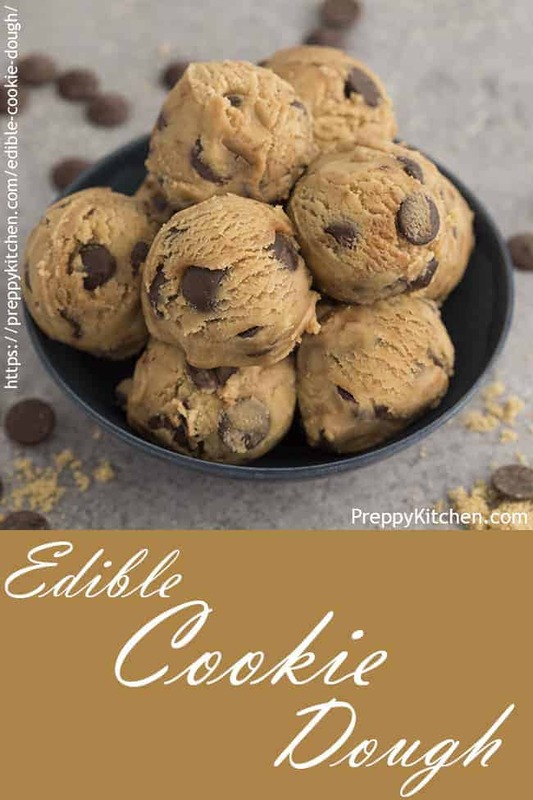 If you’ve tried this edible cookie dough recipe then don’t forget to leave a rating and let me know how you got on in the comments below, I love hearing from you! 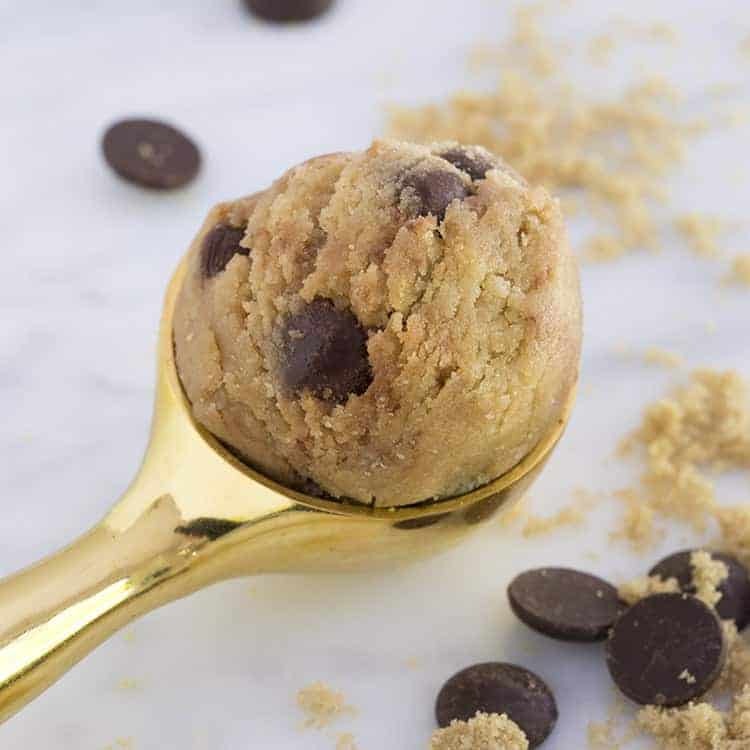 Worry-free, indulgent edible cookie dough made with toasted flour and no eggs! Easy to make and store for delicious anytime treat! Spread flour onto a baking sheet and bake at 350F (177C) for 12 minutes. Partially melt the butter in a microwave. Combine the butter with both sugar and mix until well combined. Add the salt, vanilla, and milk. Beat until well mixed. Enjoy immediately or chill in the refrigerator to firm up. Because they don't bake you actually have a lot of latitude to play with the recipe! Reduce the sugar, add more milk, try subbing some of the chocolate chips for toasted walnuts. Everything works because you don't have to worry about the bake!